The cast-iron frame, also called the plate or harp, is responsible for sustaining the massive tension of the strings. Before advances in metallurgy, the frame was made of wood, which would bend and warp under high string tension. In order to prevent this warping, the strings had to be kept at a lower tension, resulting in a softer sound. The development of the cast-iron frame in the mid 1800's allowed the strings to be held at a much higher tension, resulting in the big sound of the modern grand piano (follow the link for more information on the history of the frame). Today's frame is capable of withstanding string tensions of up to 70,000 pounds! The perimeter of the cast-iron frame is bolted into the back frame of the piano. Several bolts in the middle of the frame pass through holes cut in the soundboard, and secure the frame to the inner supporting posts. It is important that the frame mask as little of the soundboard as possible. Holes in the top of the frame, called the web, open up more of the surface area of the soundboard, allowing more sound waves to escape. 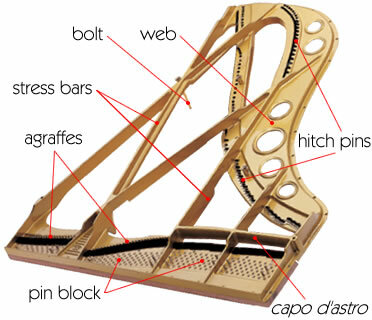 The pinblock is fitted beneath the frame across the front (keyboard) width of the piano. On the bass and treble end of the frame, agraffes are screwed into the frame. 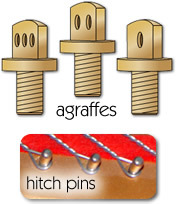 Agraffes are brass guide screws that space and level the strings as they leave the tuning pins. Each agraffe may have one, two, or three holes depending on how many unison strings it must guide. The agraffes define the speaking length of the strings on the tuning pin side (the bridges define the speaking length on the other end of the strings). On the treble end of the frame, the agraffes are usually replaced by the capo d'astro, also called the capo tasto or V-Bar. The capo d'astro is a metal bar cast as part of the frame. The bottom of the bar has a rounded, V-shape which the strings pass under. The bar presses down on the strings, defining their speaking length. On the far end of the frame, the strings terminate at the hitch pins, small metal pins that are driven directly into the cast-iron frame.